Do you remember learning to tie your shoes? Or learning to bake a cake? Or learning to read? I'm guessing you did not learn by watching a video or listening to a lecture. You learned by being shown, and by practice. The same principle applies to our teaching! We must model for our students. Use visuals or examples that are relevant? Model while thinking out loud so that students hear the process? Concisely communicate what we are doing and what is needed? Present or model only what is needed and leave the extra "stuff" out? We must become deliberate in our modeling so that students learn. Math VIDS has some great information on modeling in the classroom. How do we do that? Let's look at the Common Core Standards and focus on Reading Informational Text. Standard: Describe the overall structure (chronology, comparison, cause/effect, problem/solution) of events, ideas, concepts or information in a text or part of a text. Lesson: The standard says "describe," but that does not mean "tell." If we just say the words, very few students will understand. Telling isn't modeling. So how do we model this? Think about how we can "show" students the text. You can use timelines to show chronology. Do we do this on paper? We can, but why not use technology? There are several sites that allow you to use technology to create timelines. Check out SoftSchools' Timeline Maker or ReadWriteThink's Interactive Timeline. Model for your students how to use these apps or other software, and model how to decide what goes first on the timeline. Let the students hear you think about your decisions of what to put in the timeline. Then have them create their own timelines. What about comparisons and cause/effect? Again, use technology and let the students hear your thinking. Start with some examples where students compare objects in the classroom. You can also start with life examples where you talk about cause and effect, such as how not setting an alarm clock might mean being late for school. So, modeling is not all about the teacher doing and the students watching. It is the teacher doing while involving the students in the thinking, the doing and all aspects of the process. Modeling also means a progression of teacher doing less and students doing more. This starts with the teacher doing most of the work for one example, then less of the work for a second example, until the fourth or fifth example when the students are doing most of the work. Don't have time to do five examples? If you do not take the time to ensure that all students understand, then you will spend the time you saved by reteaching. Why not take that time in the beginning instead of later? Standard: Determine the meanings of words and phrases as they are used in a text, including figurative, connotative and technical meanings. Lesson: This can be a fun lesson or a very boring lesson. The boring lesson? Look up the words in a dictionary. Not fun for a sixth grade student. So how can we make this lesson motivating? We can model finding the meanings of words and phrases within a text. Try this: take a list of prefixes, suffixes and root words, and have students make up new words. They must define and use them in a sentence. This is a fun way to introduce parts of words. Have students present their words, definitions and sentences. Then have them write a story with their new words. Whenever I use this lesson, we all have a great time laughing, and it challenges me. Students get to see me stop them in a story and say, "Wait, I need to figure out that word." Then I get the parts of words and model how I am figuring out what the word means. They love stumping me! After this, move into a piece of text, and again stop and say, "Wait, let's figure out what that word means." Have the students help you discover word meanings using parts of words. 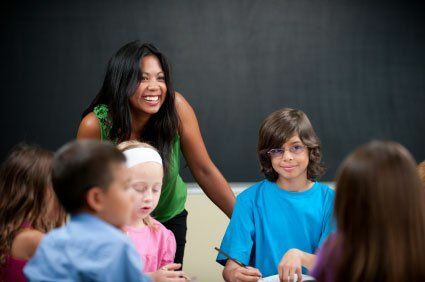 The next day, start saying, "Wait; in context, I think the word means this," and show the students how you use clues in the writing to discover word meanings. Model the thinking. Give your students the gift of learning how to discover word meanings. Again, modeling means that the teacher does most of the work the first time, and then gradually the students do most of the work. Does this take time? Yes! However, you are giving students a valuable gift of learning to learn instead of relying on the teacher for learning. So give it a try. Take a lesson where you would "tell" the students and recreate it as a modeling lesson. Then tell us about it!